This album is a musical conversation. 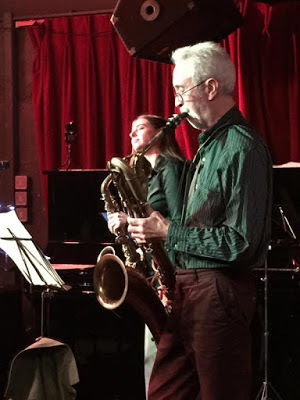 Saxophonists Allison Neale and Chris Biscoe, in their civilized and unhurried way, are the perfect musical complement and foil for each other. They listen intently, their responses always validate and respect what the other says. In 2016 more people should have conversations like this. Listening as good as this can sometimes seem like a lost art. 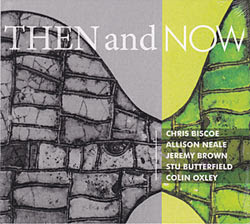 Listeners familiar with Chris Biscoe’s playing may well be surprised at quite how calm and conventional this album is. He explains: “a large part of the way I hear baritone is in its melodic role, rather than exploring sonics.” He only plays baritone sax on this album, which is a rarity in itself. The fine instrument he plays, a Conn 12M crossbar baritone saxophone from 1932, was acquired indirectly from the much-revered player John Barnes in the early 2000’s. This horn is also part of the story of how this album came into being: “I really like it, but have never recorded on it,” he says. Through their mutual friendship with pianist Kate Williams, and discussions with Stu Butterfield, the idea emerged for Biscoe to do a project with Allison Neale. They have taken their combined inspiration from the gentle sound world of the two albums which alto saxophonist Paul Desmond, a musician most familiar from his work with the classic formation of the Dave Brubeck Quartet, and baritonist Gerry Mulligan made together: Blues in Time from 1957, and Two of a Mind from 1962. Both Neale and Biscoe are clear that they wanted to go beyond the concept of a repertoire based on the Desmond/ Mulligan albums. “None of us want it to be a recreation project, we knew we should put a more personal stamp on it,” says Allison Neale. In the group's early gigs, the group played the Desmond/Mulligan repertoire, but more than half the tracks on this album are compositions or arrangements by Chris and Allison. The two-saxophone project has now become a regular working band, with Stu Butterfield, Jeremy Brown and guitarist Colin Oxley. The set-up is flexible. “We often have sitters-in,” says Chris Biscoe. Neale herself also happens to play an instrument from the golden period of instrument-making in Elkhart, Indiana, a Conn 8M alto from 1937. So this album keeps conjuring up a picture in my mind: two of the craftsmen who produced saxophones in the 1930s in the Conn factory must be up on a cloud somewhere. And when they hear the lovely tones of Chris Biscoe’s full-toned baritone and Allison Neale's lyrical alto, they can’t help themselves from smiling with satisfaction. Their pleasure is justifiable, because their craft has now been amply rewarded - with a delightful album.